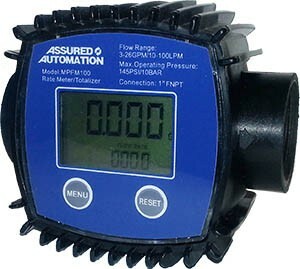 The Assured Automation MPFM Multi-Purpose Flow Meter is a general purpose, in-line turbine flow meter that is ideal for measuring the flow of water, detergents, DEF(diesel exhaust fluid) and other low viscosity liquids. The MPFM is extremely user friendly, offering a simple 2 button interface with large ½”display digits, displaying units in gallons, pints, quarts or liters. Improved accuracy is achieved with this meter as it can be field calibrated. This versatile flow meter has a resettable batch total, flow rate and also offers a lifetime total with a flow rate range of 3-26 gpm with an accuracy of +/-1% . The body and rotor of this unit is constructed of nylon and glass reinforced fiber, with ceramic bearings and stainless steel shaft and snap rings, which makes this meter rugged, economical and chemical resistant. The MPFM meter can be mounted in any orientation, or at the end of a hose. For ease of reading, the display can be positioned in any orientation on the meter in 90° increments. The batteries on this unit can be replaced which extends the lifetime. Similar models do not have this option and an entirely new meter must be installed when the batteries run out. Accessory items for the MPFM Series meters include water hose adapters. One 1″NPT Male x GH Female and One 1″NPT Male x GH Male adapters attach the meter to any traditional outdoor garden hose to monitor garden watering, pool and pond filling and a variety of other applications. Be rea dy when the time comes to replace these uncommon sized batteries. Two LR1 size “N” 1.5v Alkaline Batteries are available as add-ins. Typical applications of the MPFM Series include garden hose water measurement, fertilizer trucks, plant process water, tank filling, cement mixers, pond water feed lines, commercial washing machines as well as industrial de-icing and geo-thermal applications. This entry was posted in Flow Meters, Industrial Laundry/Washing Equipment, Latest News and tagged MPFM Series digital water meter, multipurpose flow meter, turbine flow meter, water flow meter. Bookmark the permalink.